Tom show his romantic side when he has too much time on his hands. Janeway and Chakotay are given a rare opportunity. Tom Paris sat at the helm contemplating his life. He was living one of the greatest adventures in the universe. Besides having a great job that he loved, he also had a wonderfully exciting and loving wife. And if B'Elanna was not in the mood to "entertain" him, he had many, many off-duty hobbies. And yet... all it took was one of the captain's moods to make it all seem deadly tedious. Captain Kathryn Janeway's frame of mind always affected the crew, but somehow when she lapsed into this mental state, Tom found himself tempted to do something. Few people realized that under his impetuous, devil-may-care attitude beat the heart of a true romantic. On the one hand, he wasn't so naive as to think that romance would solve all ills. 'But on the other hand,' he smiled. He admonished himself for the direction his thoughts were going. Tom knew full well that if he continued down the path he might end up with a rank even less than crewman. Why did he refuse to listen to the cautioning voice in his head when he knew ignoring it always got him in trouble? He kept his musings at bay for most of his shift. Later, he told himself that what happened next really wasn't his fault. By the end of the alpha shift, the captain had gone back and forth between her ready room and the bridge at least a half dozen times. That behavior alone was enough to make the whole bridge crew nervous. It was a sure sign that the captain was bothered by something. When she finally came to rest in her chair, it did nothing to ease the tension. Tom often wondered how he had developed his insight into the captain's moods. Perhaps it was the body language of the command team? That day he checked his intuition by turning around with the pretense of asking Tuvok a question about the sensor array. Ignoring Tuvok's answer, Tom quickly got visual confirmation of what his sixth sense had already told him. Captain Janeway sat stiffly in her command chair, her eyes unfocused, staring straight ahead. Next to her, but light-years away, Commander Chakotay worked at his console, concern etched on his face. The big man kept casting surreptitious glances at the captain. All of this was obvious only to the practiced eye of the gambler in Paris. "Captain." The tone of Tom's voice cut through the silence on the bridge like phaser through ancient steel. "May I speak to you in private at your earliest convenience?" For the briefest instant, a look of relief crossed her face before Captain Janeway answered him calmly, "Of course, Lieutenant. Right now is fine." After the ready room doors closed behind Janeway and Paris, she leaned against the front of her desk. "You wanted to discuss something with me, Tom?" "Yes, Captain." He lowered his gaze to the floor for a few seconds before he answered. Suddenly a thought struck him. Hoping he could get B'Elanna to go along with his plan, he forged ahead. "I, uh, we, that is, I mean, B'Elanna and I are... having problems with our marriage," he finally blurted out. The captain was stunned into silence for several seconds. Finally she said, "Tom, I'm so sorry to hear that. Is there anything I can do to help?" "I'm not sure what to do." His voice was tense with emotion as his hand ran through his hair. 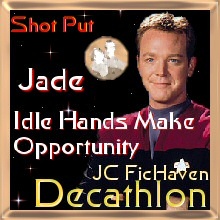 "B'Elanna is closing me out. I just can't get her to listen to reason, Captain." He paced back and forth. "She seems to be having another bout of depression, but she won't see the doc." Tom paused, appearing to be overcome with his worry. Seeming to recover, Tom asked, "Would you talk to her? I think she might open up to you." "I don't know, Tom. Counseling is a bit out of my area of expertise." "She doesn't need a counselor," Tom countered, a pleading tone entering his voice. "She needs a friend." Not being able to think of an answer, Captain Janeway patted his hand and said, "I'll see what I can do, Tom." Grasping her hand in a tight hold, Tom thanked her profusely and dashed out of her office. Crossing the bridge, Tom saw that his beta shift replacement was already at the helm so he ducked into the turbolift. Almost as soon as the doors closed, he tapped his commbadge. "What is it, Tom?" B'Elanna couldn't hide the affection in her voice. "Are you in your office?" Tom asked hurriedly. "Yes, but I was leaving in a second." "No!" he said emphatically. "Stay there and don't talk to anyone until I get there. No one! Not even the captain! Okay?" "Yeah, sure," B'Elanna sounded confused and worried. "But why?" "I'll explain as soon as I get there." Moments later Tom swept through the door of B'Elanna's office and flopped dramatically into a vacant chair. "Oh B'E, I need your help." He lowered his voice and leaned forward in the chair. "If you don't help, you will be married to an ensign or even a crewman soon." B'Elanna sighed the sigh of a Klingon trying to reign in her temper. "Thomas Eugene Paris, what have you done now?" "Relax, B'Elanna!" Throwing his hands up in defense, he began to tell her what he had done. B'Elanna jumped up and tried to pace, but her small office wasn't designed for Klingon pacing. She paused with a hand on her hip, the other in her hair and chewed on her lip. "Tom, what in the name of Kahless did you think you would accomplish?" Tom watched for a while as his wife continued to rant about his general lack of intelligence and his obvious deficiency of common sense before he stood up and wrapped his arms around her. "Sweetheart, Captain Janeway is in one of those moods. The whole bridge is walking on eggshells. Something major is bothering her and I've got a hunch it's got something to do with Chakotay." Stopping her from speaking by putting two fingers to her lips, he continued, "I think it's time that we figured out how to get those two together." "I thought that we had decided not to try to play matchmaker." She twisted away from him in his arms. "B'Elanna... sweetheart... they're miserable. It is easy to see they're in love. Everyone knows it." He wheedled, turning her face back to his. "But the captain thinks that almighty Starfleet protocol is more important than being human." He gave her his best puppy-dog expression, complete with pouting lower lip. "But, we..." he continued, kissing along her jaw line, "have to get them..." he nibbled her earlobe, "to see things differently." B'Elanna sighed deeply. Frustration was evident in Chakotay's eyes on those rare times when he let his guard down. She was willing to help her friend and former captain even though she wasn't quite sure if Tom's little escapade would work. After thinking about it, she realized that she had to help him or be stuck being in a protocol quagmire herself, married to a crewman. "Okay, Helmboy, I've always had a soft spot for the romantic in you." Leaning forward, she nipped him on the neck before she asked, "What do you want me to do?" Chakotay heard a sharp knock on his door. Knowing that only one person on board Voyager ever pounded like that for entry and that only when she wasn't in the best mood, Chakotay ordered the computer to open the door immediately. "Come in and sit down, B'Elanna." He pointed toward the most comfortable chair in his quarters. Ignoring his invitation, B'Elanna paced the room. How could she pretend that she and Tom were having relationship problems? The idea of trying to fool her old friend made her upset and nervous. The more she thought about Tom's scheme the angrier she became. She seized upon that rage and began to talk. "That Starfleet petaQ!" she spat. "What was I thinking? You should have stopped me; the captain is right. Keep the personal away from the job." "B'Elanna," Chakotay interjected. "What are you talking about?" "Tom Paris!" She sat with her head in her hands, trying to come up with a good story, although it looked like she was genuinely despondent. "Tom?" Chakotay was incredulous. "You two have been so happy together. As much as I disliked him at first, I think he's a decent guy who loves you." B'Elanna started on a tirade that lasted for ten minutes. Chakotay tried hard to follow what she was saying, but in the end all he was still completely baffled. All he understood was that she was upset with her brash, pilot husband. At the end she flopped back into a chair and stared at him. "Would it help if I talked to Tom? I'm not sure what I can say but I'm willing to try." Launching herself out of the chair, she wrapped her arms around Chakotay's neck. "Thanks, Old Man. I knew I could count on you." B'Elanna was glad that Chakotay couldn't see the look of sheer relief on her face. Tom and B'Elanna had agreed that he would leave their quarters and stay with Harry while they were "having their trouble." By the time that B'Elanna entered the mess hall in the morning, most of the crew seemed to know about the alleged split. She cringed with embarrassment as she walked to a table with her food. Captain Janeway quickly scanned the room as she entered the mess hall. Seeing the discomfited chief engineered sitting alone, Janeway grabbed a cup of coffee before joining B'Elanna. "Good morning, Lieutenant." Her voice was warm and quiet. "May I join you?" "Of course, Captain." B'Elanna moved her untouched breakfast tray to make room. She lifted her coffee cup to her lips, waiting for the Captain to speak. "B'Elanna, Tom came to my office yesterday. He told me that the two of you are having some trouble." Janeway watched her chief engineer tense up. She laid her hand lightly on B'Elanna's arm. "Would you like to talk to about it? Tonight in my quarters?" Happy that she didn't have to talk about the subject in the middle of a room filled with half the crew, B'Elanna agreed to join the captain at 1900 hours. Chakotay waited at the turbolift when he saw Tom walking toward him. "Good morning, Tom." "Good morning, Commander." Tom didn't sound like his normal cheerful self and having spent the night away from B'Elanna made the ruse easy to play. The two men entered the lift. As the doors shut, Chakotay ordered the lift to halt. "Tom, B'E came to see me last night." "She did?" Tom asked in a surprised tone. "Was she okay?" Softly he admitted, "I spent the night on Harry's couch." "She was very upset." Chakotay shook his head solemnly. "I haven't seen her this upset since we heard about all of the Maquis being killed." Tom hung his head, not knowing what to say. He felt guilty for putting his friends through this charade, however he was still convinced that the farce was for the good of all involved. "How about you come to my quarters tonight? We can talk over a few beers." Chakotay tried to ease the obvious discomfort of the younger man. "1930 hours okay with you?" "Sure, Chakotay." Tom agreed. "I'll be there." Captain Janeway wondered if she would be able to help her young chief engineer. It seemed odd to her that Tom would even think she had any advice to give B'Elanna. She couldn't even solve her own relationship dilemma. The whole week had been a difficult one for Kathryn. There was still little hope of getting back to earth anytime soon. Knowing that she would never give up that goal, Kathryn saw her life and personal hopes slowly slip away as the years went by. Whether she admitted it or not, the wedding of Tom and B'Elanna had made a significant emotional impact on her. Hope had bloomed in her mind that maybe the protocols she had surrounded herself with were not as vital and important as she had once thought. The sound of the door chime broke her train of thought. Relieved, Kathryn called, "Come in." B'Elanna entered the room, looking almost as distressed as she had earlier in the day. She sat at the captain's invitation but didn't say anything. Fidgeting with her wedding ring, she avoided meeting Janeway's glance. Knowing B'Elanna like she did, Kathryn ordered two cups of black coffee from the replicator and handed one to B'Elanna before taking a seat close by. "Thanks," B'Elanna muttered, taking the cup. Feeling even more chagrined because of her part in the deception, she couldn't seem to find her voice. However, the knowledge that both she and Tom could be in a great deal of trouble if they were caught was added motivation to keep going. "B'Elanna, you know that I will not force you to talk to me." Kathryn spoke after several moments of silence. "I just want to talk to you as a friend." Her captain's statement was almost too much for B'Elanna's Klingon honor to handle. "I'm not sure how to explain." Downing the last of her coffee, she continued, "It's just that it's just so hard to make this relationship work." At least that was the truth. "Starfleet and Maquis, the command structure, they all add to the problem. You and Chakotay were right not to get involved. The struggle is too much." There, she had said it. If this didn't work, Tom would be sleeping in Harry's quarters for good. Janeway struggled to keep from dropping her cup. She was unsure how to even respond. After all, she was the one who had suggested they talk as friends. The conversation was getting too close to home now. "I'm not sure what you are talking about, or how it relates to your situation with Tom," she said in a cool voice, as the emotions of the past weeks suddenly seemed to compound. Again, B'Elanna didn't look up. "It was obvious to the whole senior staff that you and Chakotay had decided not to pursue a relationship." That much was also true. She shrugged as she continued. "I mean, we all could see how much you loved each other, so that wasn't the reason." After a few moments of silence, B'Elanna glanced up to see the captain standing in front of her portal, watching the stars go by. Her whole demeanor had changed; her posture was one of a person overwhelmed. "I'm sorry, Captain," she hurried to say. "I didn't mean to speak out of turn." Kathryn slowly turned back to B'Elanna with obvious pain in her expression. In spite of that, she met B'Elanna's eyes. "Tonight we are speaking as friends." Taking a deep breath she continued, "However, I would like to bring the subject back to you and Tom. Do you still love him?" This time it was easy for her to answer. "Yes, I do." "At the danger of sounding simplistic, you shouldn't give up." Janeway encouraged. "As my chief engineer, you don't give up until you find a solution to a problem with the warp core. Isn't your relationship worth more to you than a bunch of coils and circuits?" B'Elanna knew that she was going to say something that could at the least get her a reprimand. The look on her captain's face moments earlier caused her to forge ahead. "I don't understand, Captain. How can you of all people say that to me?" She went on before Kathryn could interrupt her. "I just have one question for you, as a friend." Captain Janeway knew the question might be one she wouldn't want to answer, but she nodded for Torres to go ahead. "Why didn't you work out the problems in your relationship with Chakotay? Wasn't love worth the effort then?" She held up her hand, stopping a quick reply from her captain. "It couldn't be something as simple as protocols. We have broken more protocols than the legendry Captain Kirk and his crew." Kathryn wrapped her arms around herself, afraid that if she didn't she would fall apart. How could B'Elanna guess the struggle she had been going through lately? How did she deal with that question when she was still searching for the answer? Swallowing against the tears that threatened, she said in a whisper, "I can't give you an answer right now." Slowing rising to her feet, B'Elanna walked over to where Kathryn was standing and placed a hand on her shoulder. "I didn't mean to upset you. Maybe I should go. I have a lot to think about. You reminded me of what is important." And when she left, her captain was still standing, lost in thought. Taking a couple of deep breaths before ringing for entry to Chakotay's, Tom steadied himself for the next round. He wished that he knew how things were going with B'Elanna and the captain. Although it would be easier to have that information, there was no way to get it so he would push on without it. As the door slid open, Tom saw the commander sitting on his sofa with a pitcher of beer and a couple of glasses on the table in front of him. A bowl of pretzels was set next to the beer tray. "Please sit down, Tom," Chakotay offered as he poured the beer. He waited for Tom to take the chair next to him before handing the full glass to Tom. "Help yourself to the pretzels." After taking a long drink from the glass, Tom spoke, "Thanks, Chakotay." "You're welcome." Chakotay's voice was friendly as he continued, "Would you like to talk about what's wrong?" "To be honest, Chakotay," Tom spoke quietly. "I'm not quite sure how to explain. B'Elanna has been distant lately, closing herself off from me. When I do get her to say something, she keeps talking about protocols, and how hard it is for two people on a ship to be in a relationship." Tom saw Chakotay's eyes narrow at the word 'protocols.' "B'E even told me that you and the captain were smart not to get into a relationship, that it made things easier." Chakotay picked a couple pretzels from the bowl and began to nibble on them absentmindedly. He had often wondered how much the crew observed of what went on between Kathryn and him. It galled him that B'Elanna might think everyone was better off with the status quo. "Your situation is different." "I know." Frustration rose in Tom's voice. "I know that is how you see it, but B'Elanna doesn't." Silence reigned in the room for several minutes as Chakotay tried to figure out what to tell the younger man. He wanted to help, and if he knew what to say to B'E, he would have used it with Kathryn. "Did you deal with problems like this when you first wanted to get together with B'Elanna?" "Oh, yeah!" Tom chuckled at the memory of the prickly half-Klingon's resistance to his advances in the beginning. "It took a lot of work to convince her that I loved her, and that I was ready to work at 'us' despite all the strikes against us." "Maybe it's time for more of the same tactics for this time around." Chakotay mused. "Isn't she worth the effort?" Tom smiled, "You're right, Chakotay. Love is always worth the trouble." He looked down at his nearly empty beer glass and swirled the liquid around before he asked simply, "Wasn't the captain worth the effort?" The color drained from Chakotay's face at Tom's guileless impudence. The simple question stung. Did Kathryn ever ask that question? He had always thought that going along with the captain was the best way - that it was what she really wanted. Deciding that he should leave right then, Tom stood quickly to his feet and said, "Thanks for the beer, Chakotay, and for the wake up call." With that he left. It took Chakotay several minutes to realize Tom was gone. Staring at the table, he wondered what he should do now. Had he been mistaken when he gave up so easily, and too quick to follow protocols that didn't really matter? An hour after B'Elanna left, Kathryn was still pacing her floor, her arms around herself as if to fend off cold. The chief engineer's question had left her confused and without warmth. It was true that they had broken protocols, many more serious than a relationship between commanding officers. At one time she had been sure Chakotay cared for her, that he wanted to be more than her first officer and friend. That had been years ago. Did he still feel the same now or had he moved on? Knowing that the stress she had been under for the last several days had its roots in that very question caused her to come to a decision. Kathryn strode purposefully out of her quarters. Crossing the short distance to Chakotay's door didn't give her enough time to change her mind. The sound of his door chime startled Chakotay for his deep ponderings. Thinking that the young pilot might have come back, he said, "Come in, Tom." "It's not, Tom, but may I come in anyway?" Kathryn looked hesitant as she stood just outside the door. Jumping to his feet, Chakotay said, "Of course, Kathryn. Come in and sit down. May I get you some coffee?" "Need I answer that?" She grinned at him as she sat down. Chakotay's chuckle was deep and throaty before he responded, "No, I suppose not." As he took two cups from the replicator, one of coffee and one of tea, Chakotay couldn't help but wonder why Captain Janeway was there. She hadn't come to his quarters, unannounced or uninvited, in ages. Sitting down on the couch next to Kathryn, he handed the coffee cup to her and waited for her to speak. Sipping her coffee slowly, she tried to come up with the right words. There didn't seem to be any easy way to say it, to smooth things out. Maybe she should just leave before she made a fool of herself. No, she was already a fool, a fool to turn Chakotay away. "Chakotay," she said in a raspy voice, her throat dry despite the coffee she had been drinking. "I want to apologize." He hadn't been expecting her to say that. His voice was soft with compassion, "What could you possibly need to apologize for?" "Please, just let me get this off my chest." Pulling on his earlobe, Chakotay smiled slightly and leaned back against the sofa, ready to listen, but sensing her distress, he reached out for her hand and held it firmly. A grateful smile briefly graced her face before she continued. "I'm sure you've noticed that I've been preoccupied for several days." At his nod, she went on. "I've been thinking about things, about decisions I've made over the years here in the Delta Quadrant. And no, I'm not talking about the caretaker's array. These were more personal ones, affecting you and me." At that point in the conversation, Kathryn was unable to look Chakotay in the eye and began to fiddle with the handle on her coffee cup with her free hand. What if he told her that he had no special feelings for her any longer? She had to go on, no matter the outcome. "At first I truly believed that we had to be an example for the crew, following all Starfleet's rules and regulations. But as you well know, we have bent and even broken some. Hell, making Maquis part of the crew wasn't according to protocol." "We did what we had to do to survive without losing sight of Starfleet principles." Chakotay had to try to ease Kathryn's discomfort. "Yes, we did what we had to do to survive," she repeated tonelessly. Heaving a big sigh and setting her empty cup aside, Kathryn said, "I want to do more than just survive. I want to live and love - with you." Her last words were spoken so softly that Chakotay wasn't certain that he heard correctly. "With me?" he asked, hoarsely as he grasped her hand with both of his. Slipping her other hand over his, she squeezed hard as she replied, "Yes, with you, if I'm not too late because of my foolishness." His deep, chocolate-brown eyes searched her slate-blue ones. Kathryn allowed all of the love and affection she felt to show. In coming to Chakotay's room, she had sought confirmation that he still loved her, and now the evidence was shining back at her. 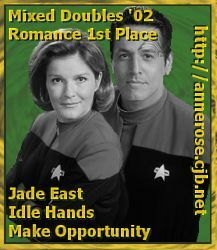 Chakotay lifted one of her hands to his lips, kissing each knuckle before turning it over to kiss the palm. "Kathryn, I love you. Tonight I had decided to tell you. I was going to come to see you and do my best to convince you to give me a chance to show you that those protocols can be worked around." He leaned forward and began to make a pathway of tiny kisses from her temple down to her chin and back to tip of her nose. Kathryn shivered with delight at his gentle assault. However, as the wonderful truth settled into her heart, she thought that she would scream if she didn't have his lips on hers. Pulling away slightly she smiled brilliantly at him before she put her mouth on his, taking it captive, in a deep, plundering onslaught. Desire snaked through her after being denied so long. Pulling back slightly, breathless from that glorious kiss, she said simply, "I love you, Chakotay. Thank you for not giving up, for waiting for me to come to my senses." Chakotay sighed as he drew her close, "I don't think I will ever get used to hearing you say that." Her smile was evident in her voice as she said, "Good, because I plan on saying it at least 47 times a day for the rest of our lives." "Why, Captain Janeway," Chakotay's dimples came out in force as he said, "I do believe that we should get on with the rest of our lives right now." "I think you are correct, Commander," she said just before kissing him again. Tom and B'Elanna set in a remote corner of the holodeck. The party in celebration of the command team's engagement was still in full swing. B'Elanna smiled as she watched the crew go up, one by one, to the captain and the commander to express their good wishes. She was going to point out how cute it was to watch Naomi hug Chakotay when she noticed a frown on her husband's face. "What's wrong with you?" she asked impatiently. "Your plan worked and we didn't get demoted to permanent hull plating scrubbers." Tom smiled briefly at her statement, but he frowned again. "All the while we were busy with our little production, I forgot to leverage a few rations on my inside knowledge. There hadn't been a new bet in the pool in ages. How was I to know that my scheme would work so well?" He sighed and drank deeply from his champagne glass. "Paris, you are such a pig!" His face lit up with a crooked smile. "Yeah, but you love this pig." Throwing her head back, she laughed with gusto. With a lusty growl, she grabbed him and kissed him thoroughly. Both Kathryn and Chakotay heard B'Elanna's laughter over the general merrymaking. They turned to each other and smiled. "I'm glad that they're okay," she whispered. "I'm glad we all are," he said before he leaned down to kiss her, much to the delight of the crew.